So I’m still figuring out how to be as a writer. It’s funny how I have no boss, no deadlines, no office, no coworkers, and definitely no paycheck—yet I feel like I am working. It’s all-consuming, even though for all my writing and editing, meeting and critiquing, researching and querying, I feel like I don’t have anything to show for it at the end of the day. I mean, there’s a word count and sometimes there is a new picture book to read my boys, but nothing that feels real. And even though I have no actual schedule–I’m still technically a SAHM—I groan when I realize I need to buy the boys flip-flops before we leave for vacation. But when? I don’t have any time in my schedule! It’s ridiculous, because I have no schedule. No one is expecting anything out of me. Oh, except Myself. I have never worked for a more ruthless, no-nonsense, no-fun boss before. In fact, Myself is making judgy glances at the screen right now, wondering why I’m blogging instead of editing that picture book I wrote yesterday. I kind of wish I could change companies, but looks like I’m stuck with this one. For life. Well, there’s always medication, right? 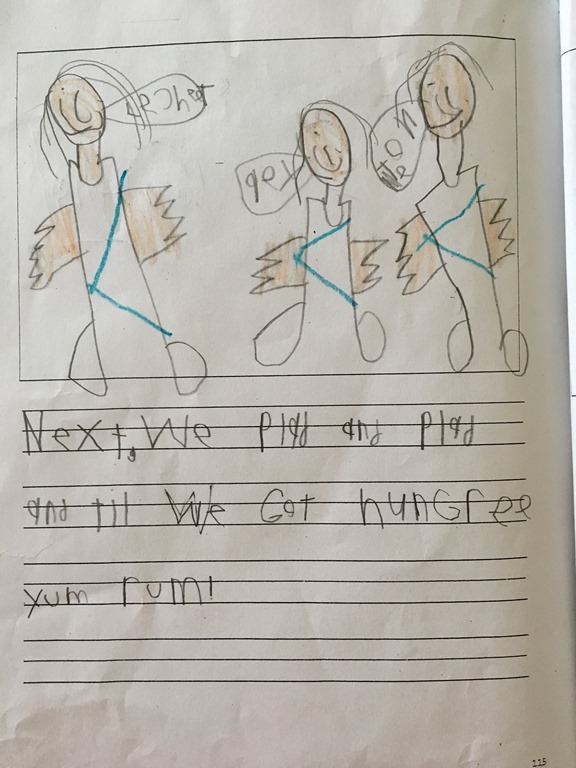 He wrote about a playdate where they got hungry and apparently got into the rum. “yum rum!” Well, at least that explains the speech bubbles. Leo’s rosy look into the future: “When I am 100 years old, I will be wrinkly and blond. I will feel sick. I will be a teacher.” He forgot to mention he will also look like the black Orville Redenbacher, but I guess that’s implied. 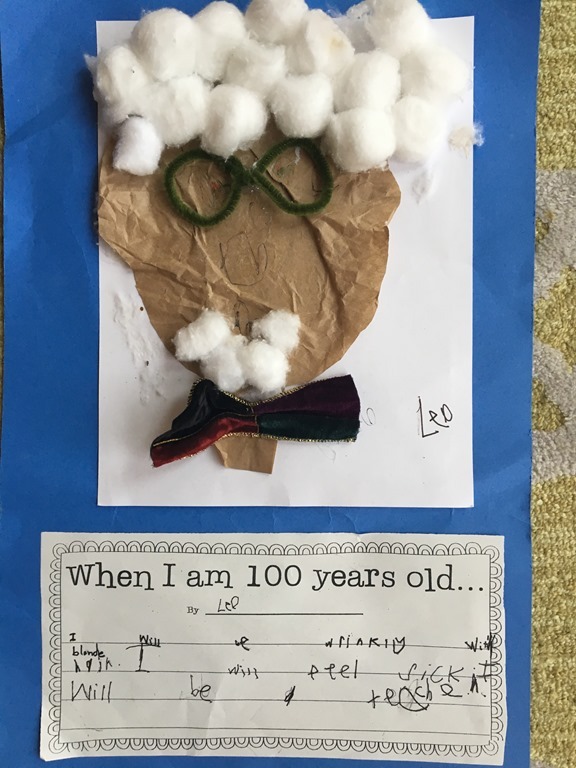 And this one’s just sweet, from the 100th day of school. Some days, I feel like I could do with 100 love. Ah! I still have a blog??! Why is nobody writing it for me? I’m still adjusting to life as a tortured artist. I spend a lot of hours in front of the computer, sometimes typing, sometimes not, sometimes banging my head against the keys then looking up hopefully to see if anything good showed up on the screen. My picture books are the bright spots in my week. This month I’ve added to the Mr. Chuck series–the wiry-haired substitute teacher whose good intentions always get bungled. I’ve written about the unlucky leprechaun who gets stuck in all the traps. 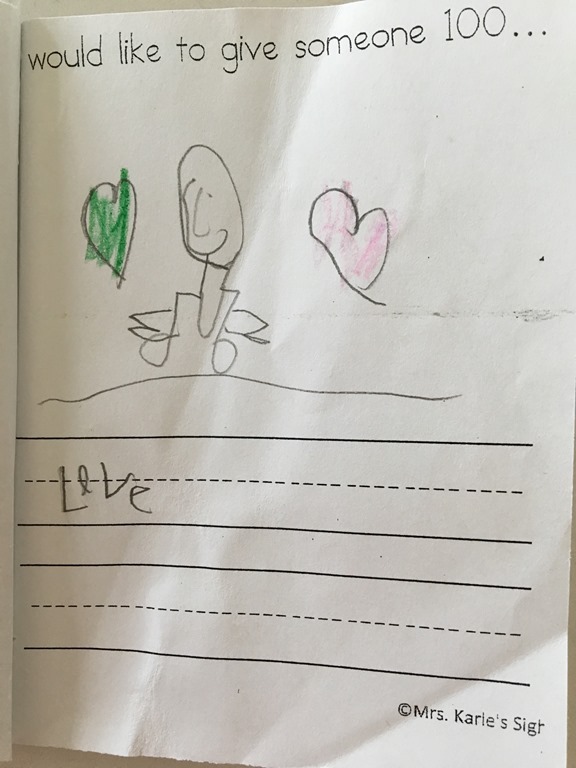 I wrote a story about a boy who buys a hot air balloon with a penny, and another about rock with big dreams of running a marathon. My novel is a different story. I regutted it only to find that the remodel job is actually a new construction job. My writing coach is wonderful, but the things she asks me to do are hard. For me, writing has always been like breathing, so hearing the advice is like someone telling me that I’ve been breathing wrong my whole life. I’m a very strong breather, and my breathing is beautiful, and I shouldn’t stop breathing, but turns out I was supposed to be using gills. It’s sink or swim, and I’m still walking around the edge of the pool, afraid of doing either. Anyway. I think I’m happy this way, and I know I’d be devastated if I stopped. So I guess I’ll just keep going, circling and circling that pool until I’m brave enough or hot enough or stupid enough to get back in. Do you remember when I had little kids and I used to start every blog post with a quickie? Back in the days when my blog wrote itself while I was sleeping? I miss those days! Leo tried to help me out this week. 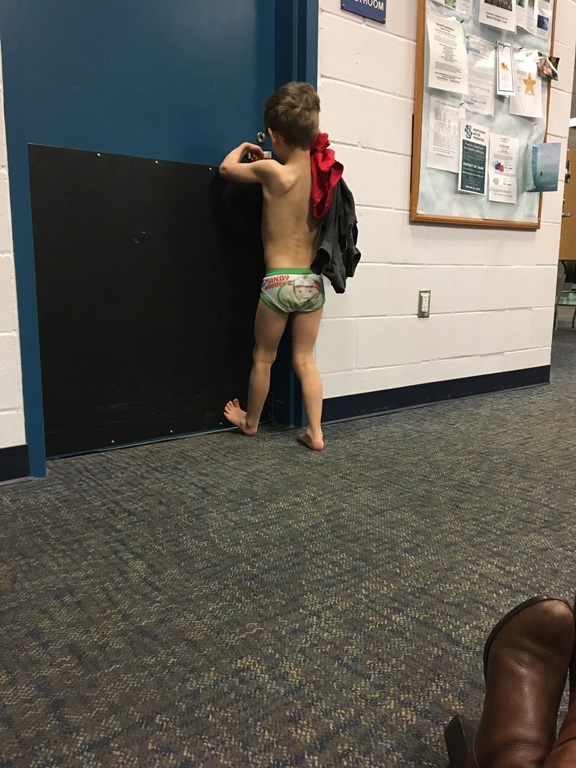 He had a major meltdown when we were leaving for swim lessons because he couldn’t put on his SHOOOOOES. 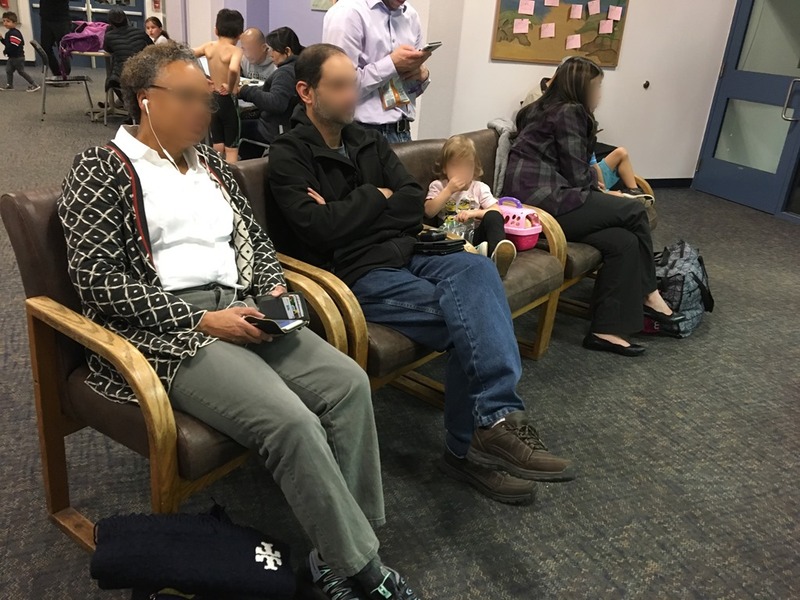 He was sitting right next to two pairs of his shoes. I told him to JUST PUT THEM ON ALREADY! But he didn’t have any SOOOOOCCCKKKS. I stepped over him on my way to the car, telling him to figure it out and ten minutes later he joined me in the car, somehow having worked through his insurmountable problems. Well thank goodness, I thought. Leo is finally figuring things out for himself. 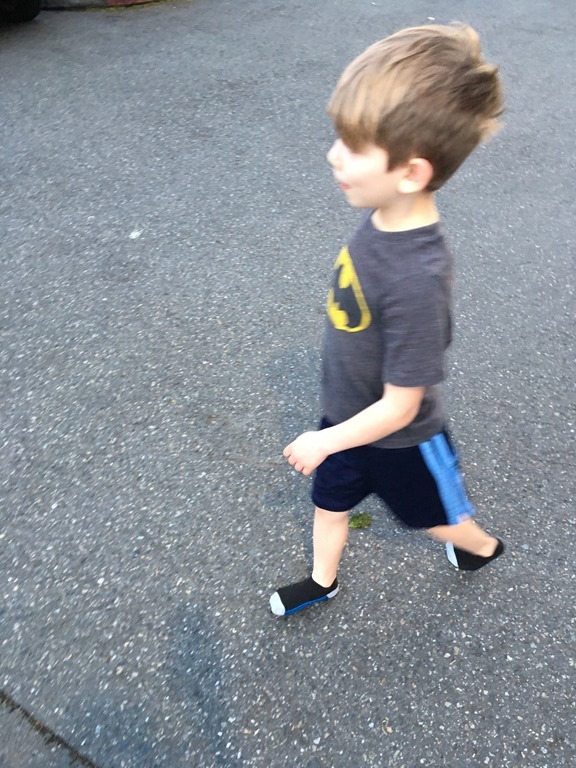 And here he is, walking from the car to swim lessons. You know, wearing his invisible shoes. Then he proceeded to get changed for swimming. Right outside the changing room. I texted this all to Kevin, telling him that Leo has gotten better at being Vincenzo than even Vincenzo is. Anyone who has read this blog since the days of the quickie knows what a bold statement that is.